The Great North Walk – May 2018. Bookings for the Friend’s extended walk for 2018 open on February 1st 2018. 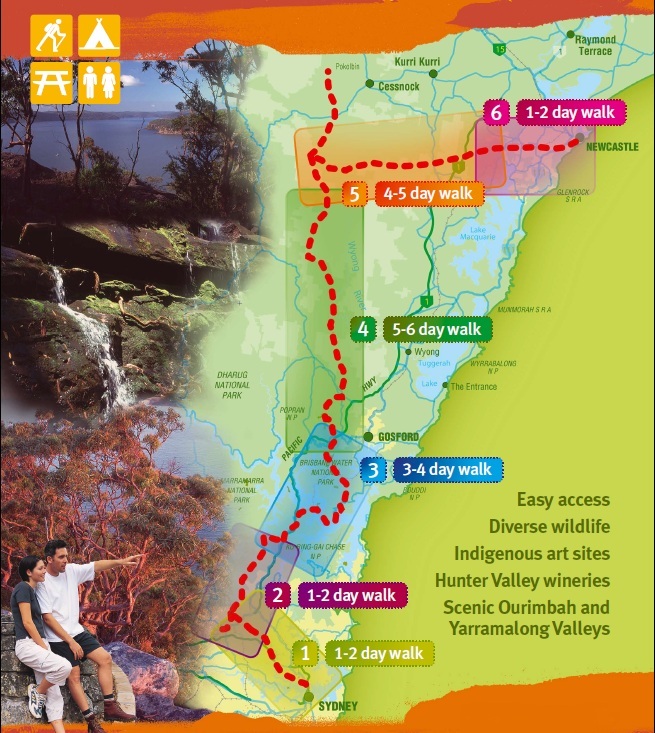 Join us as we walk the iconic 250 km trail from Sydney to Newcastle. 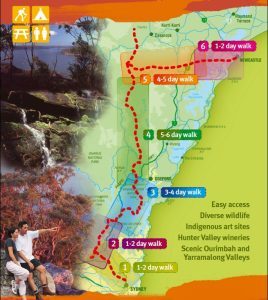 The Great North Walk is a wonderful trail following many tracks through a magnificent array of natural and urban environments. Created in 1988, as an Australian Bicentennial project, the Great North Walk is rich in the history of New South Wales. Follow the links for more information about the walk. The Friends will be exploring this long-distance Trail over 17 days in May 2018. You can find out more about this walk from Peter Solomon using the email link given in the walk description on the Friends walk calendar. To secure accommodation, bookings need to be made early. Make sure you don’t miss out on this great walk. 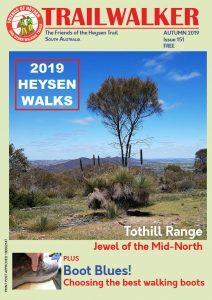 With Saturday’s election looming, Bushwalking Australia has investigated expressed policies and the track record of political parties on a range of environmental, health and transport issues that may interest walkers. “Too often, strong industry lobbies and vested interests have successfully derailed attempts to improve and reform important policies to the detriment of walkers and walking. Unlike other forms of sport, recreation and transport, the benefits of walking are not captured by powerful industries and interests, but flow across the entire society and economy, ” states the introduction. Safety in Remote Areas – should hikers carry an emergency device? A public talk on whether hikers should carry a safety device, like a Personal Locator Beacon (PLB), or Spot Tracker. How does a search and rescue operation work? What safety devices are available? Venue: Burnside City Uniting Church – Cnr Portrush Rd/Fisher St, Tusmore (Enter from Fisher Street). How SES see ‘remote’ as in ‘remote outback’. Should bushwalkers really equip themselves with a safety device? Please bring $5 for donation to offset cost of Hall hire and refreshments – there is no need to book for this event. The talk on safety for people hiking in remote areas, which was due to be held on Tuesday 12 March, has been postponed. The main speaker has been deployed to duties in Victoria. We’ll advise of the new date later. A talk on safety for people hiking in remote areas will be held on Tuesday 12 March at 7.30pm. Hosted by WalkingSA, the guest speakers are Trevor Arnold, SES Commander North Region (including Flinders Ranges) and Manager, Technical Services, and Anthony Chan, Manager, Electric Bug. Trevor will speak about when and why bushwalkers should carry a safety device; how the SES is alerted to and responds to an emergency; the time delay from distress signal to arrival on site, for remote areas like Parachilna; and what is the surest device to achieve the surest response in the shortest time? Anthony Chan will speak compare devices, including looking at initial costs, recurring costs and reliability. The talk will be at the Greening Australia Building, 5 Fitzgerald Road, Pasadena, on Tuesday 12 March at 7.30pm. Please RSVP to Walking SA via office@walkingsa.org.au or (08) 8276 5090. NT Parks and Wildlife Service have a two week volunteer opportunity assisting park rangers in Larapinta Trail maintenance in the West MacDonnell National Park. This volunteer opportunity is open to all ages and anyone interested can apply, registrations close Wednesday 21 March. Further information can be found in this leaflet, or by contacting Kelly Knights on 08 8956 7799 or email on gov..
Western Australia’s Bibbulmun Track won the Silver Medal in the Tourist Attraction category at the recent 2011 WA Tourism Awards. Congratulations to the volunteers and staff at the Bibbulmun Track Foundation!